White Rock Minerals Ltd (ASX:WRM) has laid the platform for the development of its Red Mountain VMS (volcanogenic massive sulphide) Project in Alaska by entering into a joint venture agreement (JVA) with Sandfire Resources Ltd (ASX: SFR) which will see the latter inject its financial might and multi-commodity expertise. 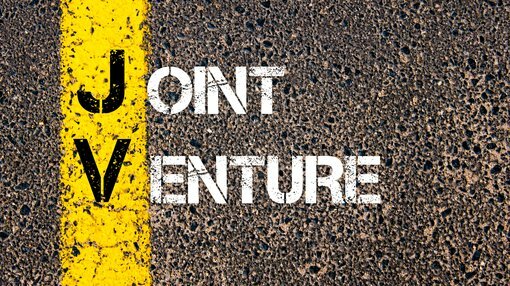 Importantly, the two parties have already worked in collaboration with each other, but the signing of definitive documentation establishes a long-term JVA between White Rock and Sandfire Resources for exploration right through to development. While White Rock has been extremely successful on the exploration front in terms of delineating two high grade deposits within the inferred mineral resource of 9.1 million tonnes at 12.9% zinc equivalent, attracting a $1 billion market cap Australian mining company which has done its own due diligence is a strong endorsement of the project’s potential. Sandfire has been in White Rock’s position, having taken the DeGrussa project in Australia from the first drillhole to a long life copper-gold producer with annual production of approximately 70,000 tonnes and 40,000 ounces respectively. Importantly, should White Rock and Sandfire move to the production phase, Sandfire’s experience in developing a multi-commodity project which benefits from precious metal credits will be invaluable. Such is the value of the precious metal component at DeGrussa, Sandfire is producing copper at an operating cost of US$0.93 per pound at a time when the spot price is pushing up towards US$3.00 per pound. Should Red Mountain be brought into production, contributions from silver and gold are also likely to have a significant impact in lowering costs. While it is too early to estimate the probable impact this could have, the fact that last year’s exploration activities returned drillhole results of more than 17% zinc, 1000 g/t silver and 6 g/t gold speaks for itself. White Rock was already in an enviable position with such a robust resource, but Sandfire Resources’ contribution has taken the project to a whole new level with managing director, Matt Gill saying, “Securing a high-quality partner with world leading expertise in the exploration and development of base metals projects is a strong endorsement of the quality and potential of White Rock’s globally significant high-grade zinc VMS Red Mountain Project. 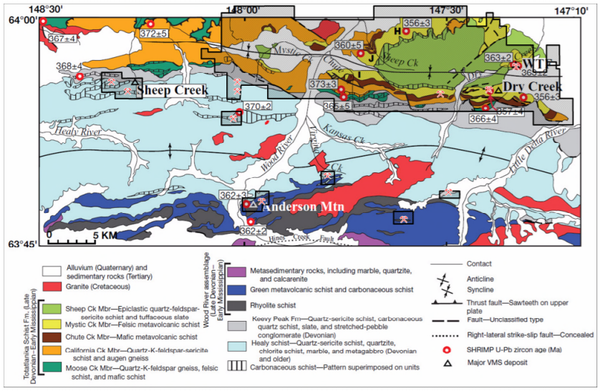 “It is significant for White Rock shareholders that the terms of the Agreement with Sandfire provide a funding pathway to advance the Red Mountain Project through exploration to the point of advanced development studies while also allowing White Rock to retain a 30% interest in any project development at the point when the economics of a project are well defined by a prefeasibility study (PFS). 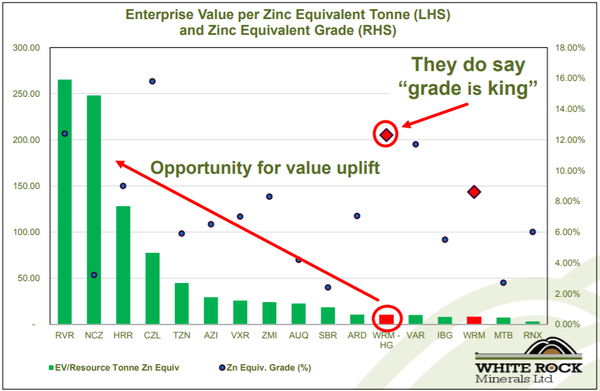 The following demonstrates the extent to which White Rock appears to be undervalued, suggesting that a clear path to the completion of studies and prospective development could see the company trading more in line with its peers. Perhaps the 20% rally that occurred on Monday morning is the first sign of a sustained uptick in the company’s share price. The Joint Venture will be incorporated and operated through a US organised limited liability company (LLC). A wholly owned subsidiary of Sandfire will initially hold a 15% membership interest in the LLC in exchange for the commitment to provide the minimum contribution of approximately $6 million, and a wholly owned subsidiary of White Rock will hold the remaining 85% membership interest, in exchange for procuring the Red Mountain Project assets are transferred into the LLC. The Manager of the LLC will be appointed by White Rock during the first year of the Option period and thereafter by Sandfire. Sandfire's funding obligations under the agreement are structured across four stages and include an option to spend a minimum of $20 million over four years to earn 51%, with a minimum contribution of $6 million in 2019. Before going into the details regarding various stages of funding associated works, one of the striking features of the agreement is its flexibility. Obviously, White Rock would like to maintain as large a percentage as possible in the project, but importantly if its financial position doesn’t allow it to contribute larger payments through the more capital intensive periods as construction and transition to production looms, the company can still maintain a smaller stake in the project while Sandfire progresses the latter stage developments. However, it is important to note that these late stage high capex works would only be progressing if a significant amount of derisking had occurred - in other words, there would be reasonable surety about the project being brought into production. Given this scenario, one would expect that White Rock and/or Sandfire could successfully obtain debt funding for a significant proportion of the remainder of the project. In order to complete Stage 2, the manager is required to deliver a pre-feasibility study (PFS) for the Red Mountain Project and Sandfire must contribute approximately $10 million in funds to the LLC over a two-year period. Subject to Sandfire funding and completing Stage 2 it will earn an additional 19% in the LLC, bringing its total membership interest to 70%. Stage 3 commences upon Sandfire completing Stage 2 and continues until the manager delivers a definitive feasibility study (DFS). During Stage 3, White Rock may elect to contribute its 30% share of expenditure. If White Rock elects not to contribute, Sandfire is required to sole fund Stage 3 expenditure and will earn an additional 10% interest in the LLC, bringing its total interest to 80%. Stage 4 commences upon the approval of the DFS by the Management Committee and continues through development to commencement of commercial production. During Stage 4, White Rock may elect to contribute its percentage share of expenditure based on its percentage interest in the LLC at that time. If White Rock does not elect to contribute, Sandfire will be required to sole fund Stage 4 expenditure for an additional 10% interest in the LLC, bringing its total interest to 90%, assuming White Rock did not contribute during Stage 3 and White Rock must repay 10% of the total development expenditure to Sandfire from 65% of its share of the project cash flow. Alternatively, the parties may cooperate in seeking project financing for the Stage 4 expenditure.